It was the double blow of the death of a best friend and a health problem that made Karen Lynch decide to quit the corporate rat race. "Losing my close friend made me realise life is too short," says Karen, now the boss of bottled water business Belu. "I wanted to do something more personal." So in 2008, then aged 38, Karen resigned from her senior role at banking group Barclays. Also learning to live with type 1 diabetes, she and her husband travelled around the Caribbean, Vietnam and Thailand for six months. Upon returning to the UK Karen applied for and got a job as marketing director at Belu, the UK's first carbon-neutral bottled water firm and a social enterprise that gives all its profits to charity. Unfortunately, at the time it wasn't actually making any money. Set up in London in 2004, by 2008 it was saddled with debts of £1.9m. Karen realised that Belu needed a major shake-up if it was going to be a success, and after knocking up a business plan outlining her vision, eight months later she was promoted to chief executive. Her plan was to pivot the business away from targeting the supermarkets and their low margins, to instead focus on supplying the more lucrative hotels, restaurants and offices. Belu had been founded by filmmaker Reed Paget, who stepped down from the top job for Karen to replace him. "Clearly it wouldn't have been the easiest time for either of us, but we did lunch and cleared the air. And Reed wanted nothing more than to see Belu become successful in a sustainable way," says Karen. "When I joined Belu it was in debt and it wasn't sustainable. We could have wound up completely - it was time to move on. So we kept the name, but everything changed." Her business plan was so successful that sales have since soared, with annual revenues of £5.9m in 2015. And since 2011 Belu has donated more than £1.5m to WaterAid, the global charity that aims to give more people in the developing world access to safe drinking water and good sanitation. Karen says that hotels and restaurants were keen to come on board because they welcomed Belu's commitment to environmental best practice, which she decided to strengthen and promote as much as possible. In addition to being carbon neutral, and donating to WaterAid, the company's bottles are made from recycled glass and plastic. "It was important to demonstrate we're doing this properly. First and foremost about our social and environmental mission, and secondly through building sustainability by giving our profits to WaterAid," says Karen. She adds that Belu forms relationships with restaurateurs who "buy into our mission", and whose customers are pleased to see the Belu name because they understand and appreciate the work it does. Karen says that this is better than "fighting for [supermarket] shelf space, and having to fund promotions to move goods from the shelves". While Belu continues to grow, Karen had to deal with another health scare in 2016. "Last year was the year from hell. I had breast cancer - thankfully I didn't have chemo, and I kept my hair," she says. "I was exhausted and knackered over the summer, but my team really stepped up." The cancer was successfully removed, and she says her work was a welcome distraction. "I clearly needed a few days at home, but when your job is your passion and purpose it keeps you going." She adds that when she was really exhausted during that difficult time, she would remember that life was still worse for a "six-year-old walking eight hours a day to collect water". This made her realise that having to deal with her bad news was "no big deal". To help limit Belu's carbon footprint, Karen encourages her 34-strong workforce to work from home when possible, to remove the need to commute. She herself lives in rural Warwickshire, and usually goes into the office in London only two or three days a week. "The rule is not to go into the office when you can work at home." Ryan Doherty, an industry analyst at research group IbisWorld, says that Belu has "garnered a reputation as one of the leading eco-friendly brands among bottled water producers". He adds: "Its targeting of the hospitality sector and its innovative approach to reducing the environmental impact of its products has driven demand from clients eager to improve their image through corporate sustainability." 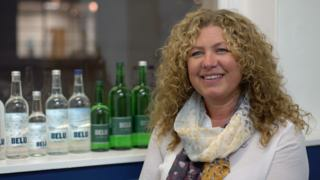 When not leading Belu, which bottles in water in Shropshire, Karen spares the time to help young start-ups who also want to achieve positive social change. She recently took part in a panel discussion for the Chivas Venture, a competition for aspiring social entrepreneurs organised by whisky brand Chivas Regal. "I love this part of my job," says Karen, who is married with two children. "It reminds me that I'm not a complete disaster, and reminds me of the progress we have made." She adds that she is keen to educate people about the reality of running a not-for-profit business. "Launching and running a social enterprise is a wonderful, aspirational thing to do. It's using your skills to do something amazing, but in reality it's harder than you think."